As the first woman lawyer in the General Counsel's office at the Equal Employment Opportunity Commission in 1965, Sonia Pressman Fuentes always intended to write her life story. The tone and direction of her tale, however, shifted dramatically one day over coffee with another author/editor. Rather than the scholarly tome originally envisioned, the novel evolved to a humorous, personal account of Fuentes' family, her life, and her place in history. Beginning with an account of her father running away from marriage, Eat First--You Don't Know What They'll Give You: The Adventures Of An Immigrant Family And Their Feminist Daughter follows her parents' marriage through the difficult decision to leave their home and business in Germany as the events leading to the Holocaust began to unfold. Eventually coming to the United States, Fuentes describes herself as a "bespectacled, asthmatic child of older, immigrant parents in a new country." Humor became a coping device - a gift she has honed to a fine edge, providing the novel a light, entertaining tone that carries throughout the pages. Wonderful vignettes such as how her father earned a B+ for saving her sewing disaster and her mother's love of night school, but sacrificing that love for her family, result in a strong, compelling narrative. Following her high school graduation, Fuentes earns a scholarship to Cornell, despite her father's opinion that too much education can be a bad thing. As her family pressured for marriage and children, Fuentes found her way to law school instead. Graduation with a law degree did not lead to a number of folks offering work, however, and the next few years provided the impetus for Fuentes' involvement in women's issues. At the age of forty-two she finally fulfilled her family's dreams for her to be married, soon having a child as well. A later divorce in no way seems to have negated her family's approval to finally have her married, and her determination to have a child will keep readers entertained. 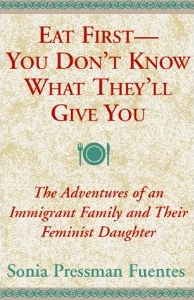 Author Sonia Pressman Fuentes presents her memoirs in Eat First--You Don't Know What They'll Give You, The Adventures of an Immigrant Family and Their Feminist Daughter. With an intense awareness of her place in history, in terms of family relations, career, and self-realization, Fuentes reveals her immigrant background, her involvement in Women's Rights, and her love for family. A woman who blazes her own unorthodox path, this remarkably self-honest memoir is a must read for all. Her extraordinary gift for an enthralling narrative and lively personality brings the text a life and vibrancy that will live in the reader's memory long after the last page is turned. Eat First--You Don't Know What They'll Give You belongs on everyone's keeper shelf.